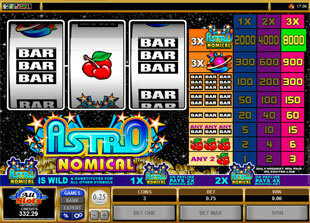 Astronomical Slots is a 3 reel 1 payline video game created by Microgaming. This classic slot invites you into the open space with the opportunity to win the top jackpot of 8,000 coins. Such extra feature as wild multiplier allows you to win bigger prizes. You can play this slot in no download version without installing software on your computer anywhere you have Internet connection. 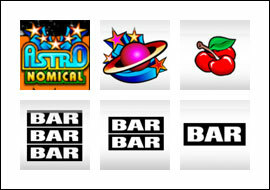 Enjoy such bright icons as Astronomical Logo, Single Bar, Double Bar, Triple Bar, Cherries, Planet. Try to get the necessary combinations of them on the reels and win the best prize possible. You can choose among such coin sizes as $0.25, $0.5, $1, $2, $5.00. In order to win the best prizes, you need to play with the maximum 3 coins bet per spin. In other words, the minimum bet that allows you to win the top jackpot is $0.75 while the maximum bet of this game us $15.00. The highest jackpot is 8,000 coins or $40,000 for 3 Astronomical Logo if you bet 3 coins per line. The second jackpot is 4,000 coins or $20,000 for 3 Astronomical Logo if you bet 2 coins per line. 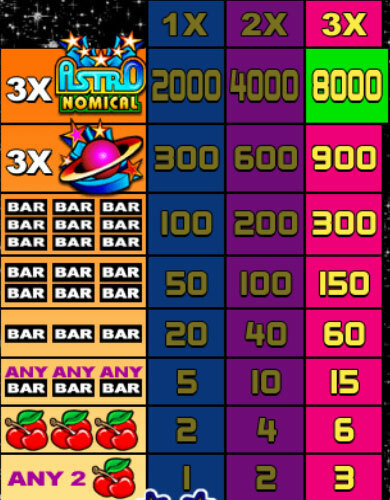 The third highest jackpot is 2,000 coins or $10,000 for 3 Astronomical Logo if you bet 1 coin per line. Astronomical Logo is the wild symbol. It can substitute any other icon to produce more winning combinations for you. The other great thing is that this icon will multiply your prizes every time it appears in winning combination. Thus, you double your award if get 1 Astronomical Logo and quadruple your prize if get 2 Astronomical Logo in winning combination. In other words, you can get 3,600 coins or $18,000 for 2 Astronomical Logo with 1 Planet instead of 900 coins or $4,500 for 3 Planets, of course, if you play with 3 coins bet. Astronomical slot machine is a classic game with simple rules and impressive prizes that can be up to 8,000 coins or $40,000. All you need is to play with the maximum bet to have chance and win the best prize of this game.